LONDON – Documents in possession of FrontPageAfrica suggest that the LD$16 billion now drawing the George Weah-led government under domestic and international scrutiny was signed for in February and March 2018 and not November 2017 as previously stated by both the government’s chief spokesman, Information Minister Lenn Eugene Nagbe and Justice Minister and Attorney General Cllr. Frank Musah Dean, who is also the chief legal advisor to the President. Minister Dean on Monday, confirmed after months of silence by the government that a Special Presidential Investigative Team, comprising investigators from the Liberia National Police(LNP), the National Security Agency(NSA) and the Financial Intelligence Unit(FIU) was constituted by President Weah and mandated to probe into information surrounding the arrival of containers and bags of moneys into the country by and thru the Freeport of Monrovia and the Roberts International Airport(RIA). According to Minister Dean, initial reports indicated that the containers and bags of moneys allegedly arrived between November 2017, prior to the inauguration of the current government and August 2018. “Evidence available to the investigative team has established that the current administration was not informed about the arrival of the containers and bags of money into the country,” the minister said. On Tuesday, Information Minister Lenn Eugene Nagbe in a VOA Daybreak Africa interview reiterated that the current administration had nothing to do with the controversial missing money controversy. In one of the documents in FPA’s possession, Ms. Grigsby-Toe, Assistant Director/General Support Section at the Central Bank of Liberia, wrote the management of the National Port Authority on February 2, 2018 notifying the port that the bank was taking delivery of the money. The communication listed the following individual as CBL staffers: Musulyn Jackson, Oldada Deshield, Zinnah Davidson, Prince Bull, Moses Kollie and from the LNP – Savior A. Howard, Jimmy Davies, John B. Forkpa, Tamba Saah, Perry G. Karr, Nawojah Gbalon, Aloysious Zoetome, Patrick Kennedy and Robert Jallah. Another communication from Mariea Gribsy-Toe, Assistant Director, General Support Section of the CBL on March 31, 2018 wrote the NPA requesting the management of the NPA sought permission the brokers in persons of Lawrence Sirleaf and Miss Elise G. N. Jolo of JVS Enterprise Inc. along with the banking staff of the CBL and ERU officers to take delivery of one 20ft container of printed materials from the Freeport of Monrovia on March 31, 2018. FrontPageAfrica also has in its possession, an application for special permit for the container which shows a shipment of banknotes from Sweden. That batch was transported by the Safmarine which arrived or was expected to arrive on November 22, 2017, suggesting that the container was docked in the port but not unloaded until February when the new administration took office. The document was processed on December 13, 2017 and the 20ft container, according to the document had a total of 8,000 printed materials containing Liberia Ten Dollar banknotes – with a valued total 506,898.00(five hundred, eight hundred and ninety thousand). Another document, a verification slip from the office of the Commissioner of Custom at the Ministry of Finance and Economic Planning showed that the ministry give a 100 percent approval to the shipment. Samuel D. Tweah, who serves as minister was one of the first appointees of President Weah in January, a couple of days after the president’s inauguration. On Tuesday, the Ministry of Information issued a circular advising what it described as “Persons of Interest” who are required to assist with the ongoing investigation into circumstances surrounding the importation of the Liberian dollar banknotes between November 2017 and August 2018, contradicting Ministers’ earlier assertions that the container was processed under the previous administration of former President Ellen Johnson-Sirleaf. Declaring that the administration is taking the matter seriously because of its national security implications, the administration has put all ports of entry and exit on alert including land borders, air and seaports, suggesting that several officials including the former governor of the Central Bank of Liberia could be prevented from traveling until the investigation is completed. 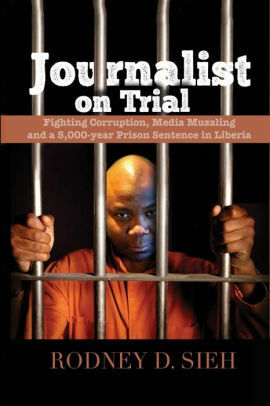 Those on the circular include: Milton Weeks, Charles Sirleaf, George Abi Jaoudi, Richard Walker, Mariea E. G. Toe, Musulyn R.B. Jackson, Ophelia Nyenpan, Oldada Deshield, Prince Bull, J. Barquolleh Gabriel, Thedosia B. Jreh, Zinnah Davison, Solomon Jaykpah, Kollie Ballah and Andrew Pabai. 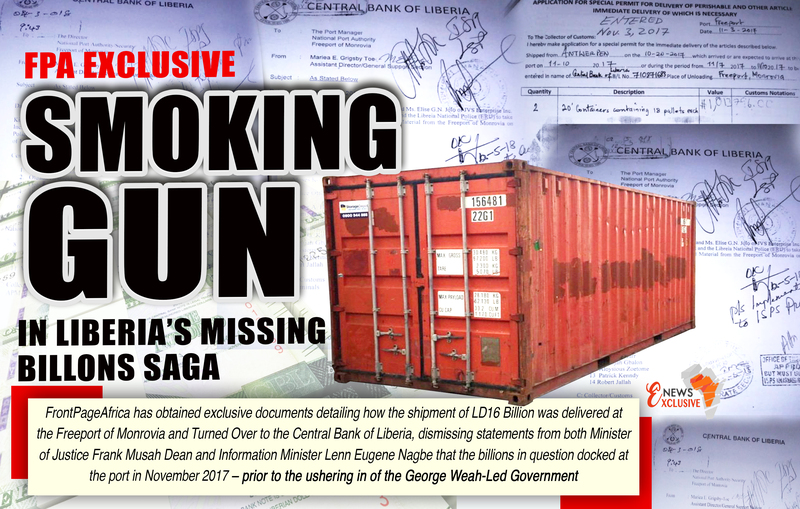 Ironically, a week prior to the revelation of the missing container full of billions of local currency, FrontPageAfrica sent out a generic email and text message to both the head of the National Security Agency and the Inspector General of the Liberia National Police making inquiries about what was in the air regarding the missing container. And most of those now said to be on the Persons of Interest list were on the list of our inquiry. FrontPageAfrica was unable to get a response from either Mr. Patrick Sudu or James Henric Pearson. In the wake of the controversy, FrontPageAfrica contacted former President Ellen Johnson-Sirleaf Tuesday to address the insinuations and suggestions from the current government that her administration may be responsible for the missing container. President Sirleaf took issue with the insinuations being thrown at her administration. Late Tuesday, a former banker who preferred anonymity said that if the head of the government is not complicit into the huge scandal involving the missing money container, of 16 billion Liberian dollars, it can easily track the missing container; because, according to him the process of importing money is simple. He explained that the process of importing money principally involved two individuals, namely the Comptroller, and the Head of Treasury. The comptroller or the Head of Treasury develop a code, which is sent to the importer of the money. As the controversy intensifies, several opposition parties are now joining the call for an independent probe. Mr. Alexander Cummings, the leader of the opposition Alternative National Congress (ANC) says all Liberians should be very alarmed by the alleged disappearances of containers and bags of moneys amounting to L$16 billion from the Freeport of Monrovia. “I want to say formally, all Liberians should be demanding an independent investigation,” he said on Sky FM in Monrovia on Tuesday morning. Would US-China Spat Hinder Liberia’s Quest For Beijing Funding?